University of Edinburgh, School of History, Classics & Archaeology is proud to commemorate the 1200th Anniversary of the death of the emperor Charlemagne on Tuesday 28th January 2014 with two special events sponsored by the European Commission in Scotland. 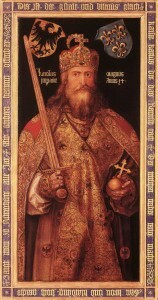 A workshop for postgraduates in medieval studies programmes with two distinguished scholars; Professor Mayke de Jong of the University of Utrecht and Professor John Mitchell of the University of East Anglia, will assess what Charlemagne’s achievement means to them and the present state of Charlemagne scholarship. At 4pm a public round table with a panel of distinguished scholars will discuss ‘Charlemagne: Life, Legend and Legacy’. All are welcome to attend this free but ticketed event which will be followed by a reception. The emperor Charlemagne is widely seen as the greatest of medieval rulers and a key architect of the political and cultural scene of Europe as we know it today. At the same time his legacy remains controversial, and at a time when many in Britain are questioning our relationship with Europe, it is striking that scholars and advisors from the British Isles were major contributors to his ‘project’ and that British academics have been preeminent in recent Charlemagne scholarship.